AL VIA LA NUOVA STAGIONE TARGATA 2019 IN PISTA . 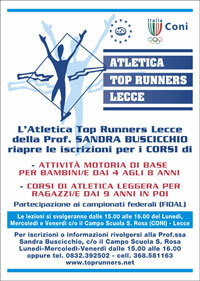 DAL 31 MARZO GLI ATLETI DELLA TOP RUNNERS LECCE SARANNO IMPEGNATI NELLA PISTA DI LECCE PER IL CAMPIONATO REGIONALE PENTATHLON LANCI. IL 6 APRILE ORGANIZZEREMO LA 16^ EDIZIONE DEL TROFEO CITTA’ DI LECCE E 1^GIORNATA STADION. PROSEGUONO GLI APPUNTAMENTI IL 13 APRILE PRIMA GIORNATA DEL PROGETTO IRON BOY-GIRL E IL 27 E 28 CDS RAGAZZI/E E CADETTI/E.